It was a pleasure seeing Sabido & Basteris at the NYIGF (New York International Gift Fair) and perusing the fall collection. Part of The Filo D'Argento Collection, are more variations of the friendship bracelets, woven with silver filigree thread in complimentary colors including pinks, blues, purples, gold and silver. This confetti ring is fun and colorful, yet delicate. 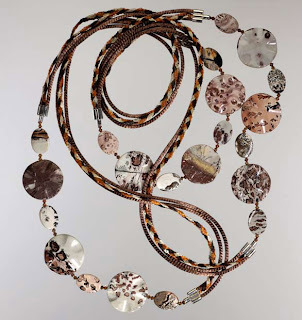 This necklace is part of The Pierres Du Monde Et Argento Collection, made of mother of pearl, subdued earth colored fossils and silver threading. This is one of my favorites, as it can be wrapped around more than once and allows you to choose where you want it to fall against your body. This necklace is part of The Colori D'Argento Collection, made with lustrous silver hue threads. 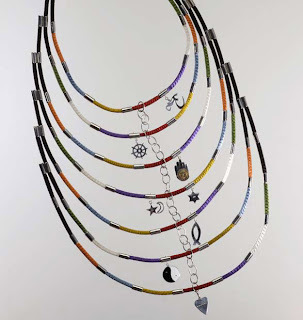 This International necklace features the seven religions of the world, including symbolic colors such as black, orange, green, blue, red, mustard yellow, white and purple. Sabido & Basteris necklaces are great for layering and the extra links at the back of each clasp makes it easily adjustable. Here's an interview with Victor Sabido Basteris.